The world's airlines have no standardized carry on luggage size limits making it difficult to buy one bag that will always meet the requirements. This page was built to help ordinary muggles untangle the carry on mess while keeping their sanity intact. 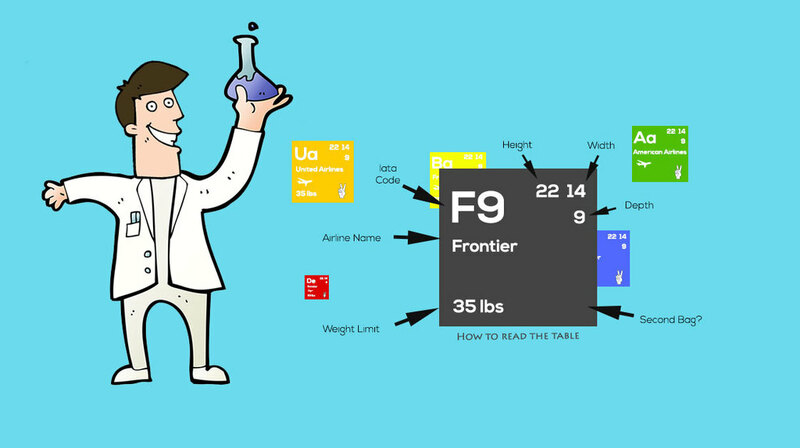 Our handy "Periodic Table of Carry On Luggage Size Limits" will help you conjure up an airline that fits your bag or failing that a bag that fits your airline. This page is about sizes, if you are looking to find your perfect carry on bag you can find it here. All it takes is smidgen of physics and a little alchemy and soon ... abracadabra! alakazam! Your carry-on bag will magically fit and you'll defeat those wicked airlines! In 2015 an IATA “Cabin Ok” Initiative to introduce a “optimum size” and “Cabin OK” logo for bags was put on ice because of a consumer backlash. The proposed scheme would have effectively changed their guidelines and new bags manufactured under 56cm x 36cm x 23cm (22” x 14” x 9”) would have been labelled “Cabin OK”. The plan did not require individual airlines to change their maximum sizes. We recommend a carry on luggage size that falls within the following dimensions to conform with the current requirements of most airlines. Cabin bags within these size limits will be suitable for a greater number of airlines but still provide a decent amount of space. In our opinion this is the sweet spot for cabin bag dimensions but your millage may vary. The L﻿﻿﻿﻿ipault Paris (seen below) is a perfect example of this size. It's real world size is 21 x 14 x 8 inches even though the manufacturer says it's a 22 inch bag... the mind boggles )) Plus the fact that it's an ultra light bag makes it ideal for both domestic and international travel. Remember a carry on duffel bag is also a good option for those that like to think outside the box. Frequent fliers that travel on multiple airlines particularly those who travel to Europe may wish to consider purchasing 2 bags - one larger bag and one smaller bag to use with budget airlines that have more restrictive policies. Did you book your accommodation yet? The following tables are accurate as of 06/03/2016. Please check with your airline before flying. Links are provided. Note: Spirit Charge $35 for a carry on bag. Only the personal bag, backpack or purse is free. Yes. One personal item, such as a purse, briefcase or laptop computer. One personal item. 8 x 14 x 18 Inches (including handles, wheels, and straps). Think purses, briefcases or computer bags. All personal items must not exceed 17" L (43.2 cm) x 13" W (33 cm) x 8" H (20.32 cm), including wheels/handles, on all of our aircraft types. Personal item. The maximum dimensions for your personal item, such as a shoulder bag, backpack, laptop bag or other small item, are 9 inches x 10 inches x 17 inches (22 cm x 25 cm x 43 cm). Yes 1 small personal item. Note: For Transport in the Cessna 402, Cessna Caravan Amphibian and Britten Norman Islander items must be carried to the aircraft and stowed by a Cape Air agent into the designated baggage compartments prior to boarding. You may also take the following onto the aircraft with you: a coat, an umbrella, a walking stick/crutches, a camera, binoculars, a reasonable quantity of books and magazines, a baby basket or folding pushchair and a suitable quantity of baby food. "possibly one of the following accessories: a handbag or briefcase or camera, or camera, or small laptop or one item of the same size or smaller." Yes. Briefcases and laptop computers are considered hand baggage and may be brought on board in addition to the limits indicated. "1 PC bag" whatever that means. Yes. One personal item, e.g. handbag, umbrella or a bag containing tax-free merchandise. Portable computers, cameras and other valuables should be carried as cabin baggage and should not be checked in. You’re allowed a few things e.g. Yes. One additional item of under seat cabin baggage, such as a laptop or handbag. Each passenger with a seat reservation may also bring a laptop case/handbag/rucksack as well as their hand luggage. No. Only business class has a second bag. Your personal item (e.g. small handbag or laptop case) must fit comfortably under the seat in front of you. plus 1 small bag up to 35 x 20 x 20 cm. In addition to this allowance, all passengers are allowed to bring a handbag or small laptop bag on-board for free. One handbag, or briefcase, or piece of equipment that can be placed under the passenger's seat, or in the aircraft's specific compartment inside the cabin. No. Only first class or business class gets a 2nd bag. Yes. "Small suitcases, handbooks, laptops, books and small duty-free goods"
Yes for customers with a confirmed seat. Handbag, laptop, small backpack, briefcase. Yes. Laptop, purse, briefcase, small backpack. "shopping bag or hand bag"
Yes. Handbag, thin laptop, purse. Personal items such as one ladies handbag or one small briefcase, walking sticks, cameras, and duty-free items purchased on the day of your flight are not counted towards your hand baggage allowance. Yes. Handbag, laptop etc 3 kg max. Yes. Handbag or laptop. It's weight counts towards your 7kg overall limit. You are allowed a 2nd bag the same size at the 1st (48x34x23cm) or a garment bag (114x60x11cm). In addition to this you may also have a thin laptop, a handbag or a purse. Allow one unspecified personal item. "Laptops are permitted and are not considered as hand baggage." Yes a small item... purse or laptop is allowed. Please be aware these size details are not guaranteed. Check with your airline for up the most up to date carry on luggage size restrictions. How Strict Are Airline Baggage Policies? Many times if your bag is slightly larger than the advertised size restrictions you won't have any problems. But do you want to take that chance? ​International Airlines can have strictly enforced weight limits so you need to think seriously about the weight of your case. Personally i always try to make sure my bag is within the limits because I don't want the hassle and I don't want to feel like I'm trying to sneak on a bag that is too big. It's just stress that I don't need! Can I take a garment bag as a carry on? Yes you probably can but you will need to fold it to fit the size restrictions. Some airlines let you hang your items in the flight closet if there is space and it can't hurt to ask. However you need to be prepared to fold your garments. There are some carry on bags that are dedicated to keeping your clothes wrinkle and crease free. Here is a link to our detailed page to find out about garment bag size limits. Why Are These All Rolling Bags Where Are The Backpacks? We created a separate page to look at the best carry on backpacks here. ​P.S. We went to a lot of trouble to compile this information and if you Like Us On Facebook or Tweet about us we'll be your best friend forever.